Less than two weeks ago, the lavish Ritz-Carlton Hotel in Riyadh was playing host to some of the world's top executives. Now it appears to have become a detention center for Saudi royals ensnared in a corruption investigation. At least 17 Saudi princes and top government officials were arrested on Saturday after King Salman bin Abdul Aziz ordered the unprecedented purge. 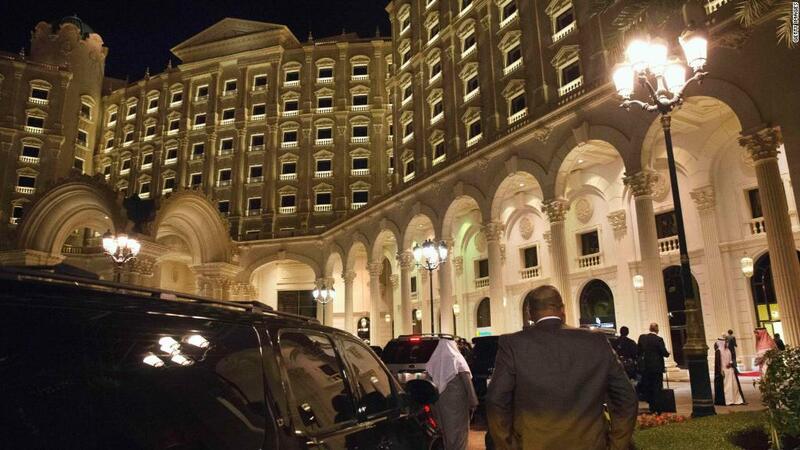 Reuters and the Wall Street Journal reported that at least some of those arrested were being held in the 5-star hotel. CNN was unable to independently verify the reports, and the hotel's owner -- Marriott (MAR) -- would not expand on a statement issued Sunday that it was "evaluating the situation." There's plenty of evidence of unusual activity, however. Booking websites show the 492-room hotel in the Saudi capital as completely unavailable until the end of November. A member of The Ritz-Carlton's marketing team said Monday that it would only start taking bookings again from December 1. 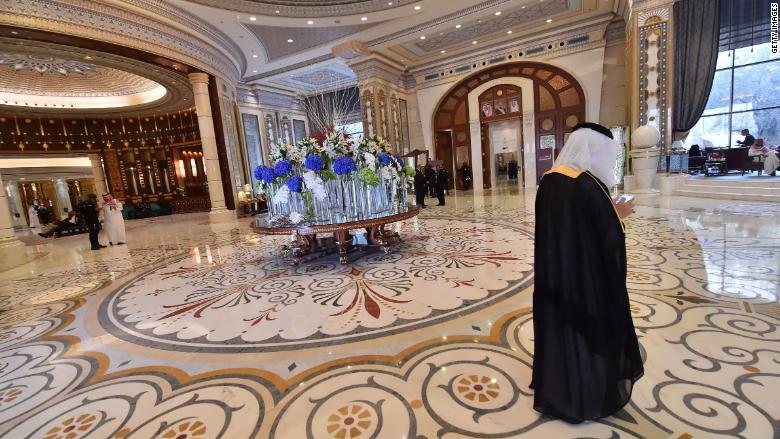 A CNN producer in Riyadh visited the Ritz-Carlton on Tuesday and said the entrance gates to the hotel were closed, although there was no obvious security presence outside the 52-acre property. 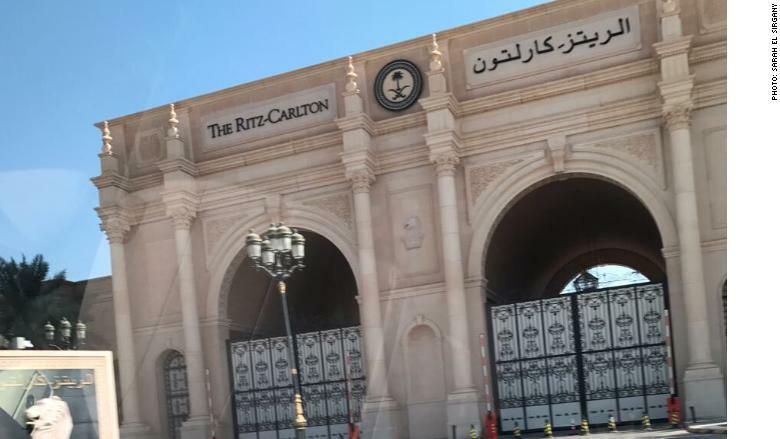 Gates at the Ritz-Carlton in Riyadh were closed on Tuesday. Social media was buzzing with speculation about the Ritz-Carlton after tweets suggested guests were forced to leave the hotel over the weekend. And communications with the hotel have been cut off. "Due to unforeseen circumstances, the hotel's internet and telephone lines are currently disconnected until further notice," according to the hotel's web page on Monday. Interior of the Ritz-Carlton in Riyadh in May during President Trump's visit to Saudi Arabia. Among those arrested are billionaire businessman, Prince Alwaleed bin Talal, the former head of the royal court Khaled Al-Tuwaijri, and Saudi media mogul Waleed Al-Ibrahim. The Ritz-Carlton would make a luxurious detention center for some of the Middle East's richest men. Its rooms include two-bedroom Royal suites, and it offers a "gentlemen's-only spa," several high-end restaurants and 52 acres of gardens. It is also where U.S. President Trump stayed during his visit to the kingdom in May. An image of his face was projected on the exterior of the hotel. Exterior of the Ritz-Carlton hotel in Riyadh during President Trump's visit in May. In late October it was the venue for a huge investment conference, dubbed "Davos in the Desert." It attracted more than 3,500 business leaders and government officials including HSBC boss Stuart Gulliver, International Monetary Fund chief Christine Lagarde and Softbank CEO Masayoshi Son. The conference was spearheaded by Crown Prince Mohammed bin Salman, who is pushing an ambitious reform plan that is aimed at reducing the country's dependence on oil over the next decade. The prince is also leading the anti-corruption committee that has the authority to investigate, arrest, issue travel bans and freeze the assets of those it finds corrupt.